Wilder Gonzales Agreda invited me for an interview about my new project ‘Aurora’ and vocal practice. 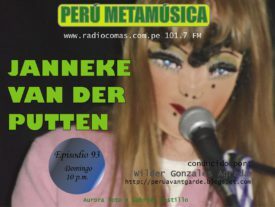 It will be broadcasted on Radio Comas, at 10pm Lima Time, on 101.7 FM. It will be diffused online through the website of Radio Comas. Listen here to the interview, starting at 33’05” minute. Press releases of the interview at the cultural page of Rock Achorao’, Lamula.pe and at Peruavantgarde.